Time to start working on the wheels. With the help of Mr Stock and Nick from Year 11 I’ve successfully modeled the hub and tyre components of the wheel. 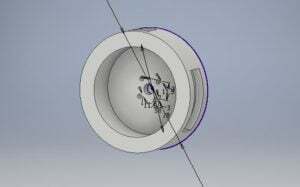 Using Inventor, I started out with a basic sketch of the Hub outlining the main body including holes for the servo. After extruding the sketch for the width, I added a work plane to the outer edge of the hub and drew a basic rectangle in the center. This would form the basis for the tyre inserts. 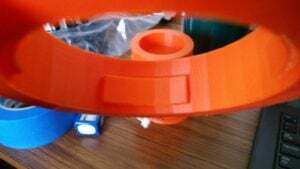 Using the emboss feature, the rectangle was cut out of the hub body and afterwards revolved the cut around the outside of the hub for three tyre inserts. Now that the hub is finished, it’s time to start on the tyre mold. This would be a bit trickier than the hub because of the spikes. Again we started out with a sketch of the inner tyre and extruding. Next was the same as the inserts on the hub, except instead the rectangles are protruding out of the inside edge to match the hub. For the spikes around the edge, a new sketch was started. By drawing two lines, extruding and revolving the single spike around 12 times, the wheel was mostly complete. The next stage was a bit finicky. Aided by Nick Cresswell in Year 11, for the angle on the spikes we drew lines through the centre of one of the spikes to outline the cut. Then, using the sweep and mirror tools cut out chunks on both sides of the spikes for the angle. Next I used the fillet tool to round the edges and tips of the spike for less sharp edges. After printing, it was decided that the diameter of the inner tyre and the spike length needed to be altered. The diameter was raised from 88mm to 94mm, and the spikes changed from 20mm to 26mm. After printing, we realised that the emboss in the center had shifted sideways caused by the sketch being edited. So, back to Inventor to fix this up. I had to further extend the diameter of the wheel so after doing this we re-constrained the emboss sketch to the centre of the width. I also had to re-constrain the wheel spikes as they didn’t have the same length on both sides. We’ll see what happens with this print and hopefully this will be good! Erin is our 3D designer who creates and improves parts for our robot. She has an extensive knowledge of Blender and knows several languages such as Italian, German and Japanese. Sidenote: not a Nazi. 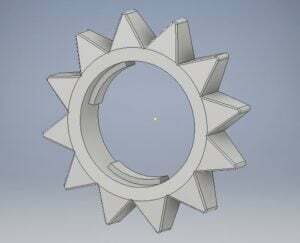 She is the brains behind a number of our mechanical designs including the wheel systems.She often has ideas on improving the robot that somehow no one else even considered. Contains such ideas in a mythical orange folder hidden somewhere in a faraway place. Secretly also a dragon. "If no one comes from the future to stop you from doing something, then how bad of a decision can it really be?"